This is the seventh in a series of interviews. 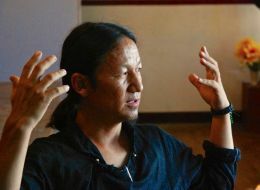 While working last summer in Dharamsala, India, I talked with leading members of the Tibetan exile community about the freedom movement and the future of Tibet. Smuggled out of Tibet as a child, writer Bhuchung D. Sonam has gone from Dharamsala to Delhi, Nepal, and the U.S. -- and back to Dharamsala. He says that living in exile "haunts you, but you can't say you suffer and bang your chest. It's not a solution. So my way to creatively challenge this harsh reality is writing." Bhuchung's publications include Dandelions of Tibet, Muses in Exile: An Anthology of Tibetan Poetry, and Songs from a Distance. Over Tibetan momo dumplings one sunny afternoon at Hotel Tibet, he explained how exile has influenced his work and why writing is the key to survival. Sophia Slater: Can you tell me a little about yourself? Bhuchung D. Sonam: I was born in Tibet, in a very small village, about 360 people. We had no light, no roads, no running water. So in early 1984 I was smuggled out. I went to school at the Tibetan Children's Village here and then on to college and graduate school. I've been in Dharamsala, Delhi, Nepal, the U.S. -- where I studied mass communication -- and finally, back to Dharamsala. These are the dots that connect my life. In exile, you have no fixed place called home; you have to connect the dots to know who you are. SS: Why do you write? BDS: Writing came because it's something I have to do. Since the age of 10 or 11, I've been separated from everything I associated myself with: childhood, family, place. That dislocation haunts you, but you can't say you suffer and bang your chest. It's not a solution. So my way to creatively challenge this harsh reality is writing. It not only saves you from the pain, it makes other people understand who you are and the story of Tibet emerges on a larger scale. SS: What's the relationship between writing and exile? BDS: In one way, exile is good because ultimately what you write and articulate has to be based on your experience. In exile, because we don't have anything of our own, everything is adjustment and giving up. This makes us rich in terms of experiences. In that sense, exile is good for any creative artist. It also gives you a more subtle understanding of "home" and "survival" because that's what you have to tackle every day: yearning for a home and facing so many problems. It makes you look at things in a more nuanced way. SS: You've said, "Tibetans need to take control of their own narratives." What do you mean by this? BDS: In September 2007, I was studying in Boston. Our journalism class had about 40 students, and each of us had to say something about ourselves. I said I was born in Tibet and lived in India for a long time. One guy went, "Yes, yes, Dalai Lama." Another guy said, "Yes, yes, monks." I was talking in their language, standing there in front of them, just like them, but they did not connect with who I was as a person. They connected me with the Buddha and their idea of Tibet and monks and the Dalai Lama, and this is supported by books such as The Third Eye that are projected images of Tibet, not the real thing. For Tibetans to be perceived and interpreted as who we are, we have to speak. Each Tibetan has so much to tell. SS: What's your goal or purpose as a writer? BDS: Ideally, if I live in a free country and want to be a writer, I should not have a goal or purpose. Every creative artist should have freedom. But even though I don't want something, it may be forced upon me by circumstances. So my idea is to tell the story of Tibet based on my personal experience. When you take away a face from a particular struggle, the struggle becomes cold and devoid of feeling. If you succeed in telling the story of Tibet based on a human experience, it becomes much more enjoyable and valuable. A work of art, say a poem, based on the element of human experience is of universal value and may lead to a more general understanding of Tibet. SS: What's the strongest emotion you've felt? BDS: Loneliness. It's the fact that you cannot become who you are because of circumstances. This makes your whole life lonely because you can't go back to the place of your birth, you can't talk to your parents, you can't talk to your brothers or sisters. So even though you may not be lonely in an individual day-to-day sense, it makes you disconnected from who you are. SS: Should the Tibet movement go in a new direction? BDS: That's a big question. I don't know. The strategy of the last 50 years has led to a failure to provide any kind of improved situation, whether that is the situation inside Tibet or even the relocation and sustenance of the exile community itself. Unfortunately, I do not have the solution. In the long run, a revival and re-rooting of young Tibetans -- wherever they live -- in the history and culture, and an understanding of the people, is really important. On top of that, young Tibetans need to be educated and articulate. If we have more such people, then we might have a new perspective and meditation on how we should approach Tibet. That makes me hopeful for the future.